American college culture is at a critical point where adherence to political correctness threatens to undermine the sanctity of free speech, a supreme value of higher education. This conflict intensifies in a period where “trigger words” and “microaggressions” make college curriculum a virtual landmine. This comes simultaneously in a political climate where numerous pundits and politicians are in revolt against political correctness. When a comedian like Jerry Seinfeld, who built his career on joking about mundane misadventures and everyday boredom, refuses to bring his act to college campuses because he thinks students will find it too controversial, it is reasonable to say political correctness probes at the binding of the nationwide college community and demands re-evaluation. 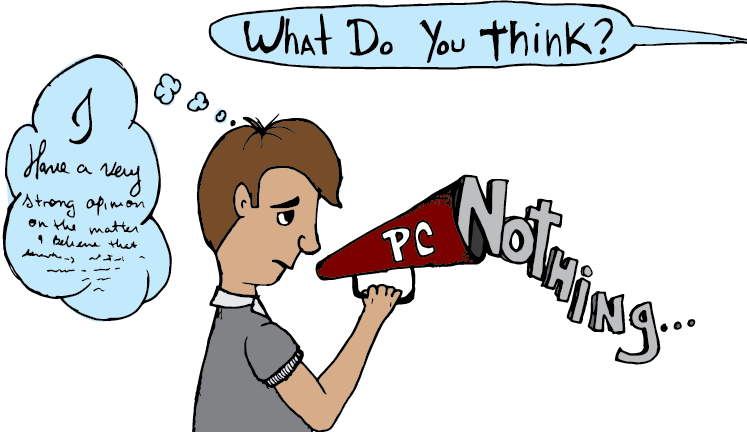 Political correctness is an imminent problem when it constricts ideas and academic dialogue. The phenomenon is a set of approved ideas, outlooks and vocabularies, which in theory promote an environment where the majority of people are not marginalized or offended. More specifically its intent is to shield historically and/or potentially vulnerable groups like ethnic or religious minorities, victims of abuse and disabled people from psychologically harmful or uncomfortable situations. This is a commendable sentiment that affirms the virtues of tolerance, in the abstract. However its literal application is not as utopian. Academic ecosystems should stimulate intellectual growth, foster bold thinkers and challenge them to question established ideas and their own beliefs. Students must be at liberty to explore concepts and arguments that stray from the sterile boundaries of political correctness without apprehension of their peer’s scorn or exclusion. If ideas are expressed respectfully and do not objectively incite violence or infringe on the rights of others, then they are valid and worth contemplation and discussion in a college setting. Political correctness is a type of ideological filtration, which boxes serious discussions into predetermined outcomes. For example, under the rules of political correctness conversations on race relations must not criticize the tactics or rhetoric of advocacy groups representing disenfranchised peoples. Supporters of political correctness often interpret criticism of such groups or really anything short of praise as rejection of racial justice, and publically coerce criticizing parties into abandoning their positions through social media harassment. Ironically, these critics usually agree with the overarching ideals of racial equity and only differ on matters of style and approach. Take presidential candidates Martin O’Malley and Bernie Sanders. While speaking at a liberal activist forum in Phoenix in July 2015, members from the Black Lives Matter movement accosted them on stage and declared that if the candidates failed to bend to their vocabulary, then they were unsympathetic to protecting black lives. The candidates both fumbled with the confrontation and delivered responses that were unsatisfactory to the activists. Social media personalities pounced in earnest. Black Lives Matter is the not the grand judiciary of racial justice and their noble objectives don’t automatically vindicate their practices. Sanders and O’Malley both champion economic and social policies beneficial to African Americans, including criminal justice overhaul, police reform and easier access to higher education. Sanders marched with Dr. Martin Luther King Jr. during the Civil Rights movement, and O’Malley soothed race relations in his eight-year tenure as mayor of Baltimore. Their race credentials should not be at the mercy of disruptive activists’ approval, nor should anyone’s. Santa Rosa Junior college film instructor and Petaluma campus cinema series director Michael Traina said he received more requests from students in recent years to abridge films with controversial content from the series or to issue “trigger warnings” about potentially upsetting scenes. He said he thinks this is indicative of a larger educational trend of customer service college, in which students expect curriculum tailored to their comfort zones. Political correctness has value. Peoples of all backgrounds deserve dignity and societal assimilation, which political correctness contributes to in part. American society’s progress in gradually discouraging discrimination and racial slurs is reassuring to man’s continuing endeavor for justice. Many public figures, including several presidential candidates, abuse the failings of political correctness to justify their own bigotry. Issues like immigration and the definition of marriage are fit for public forum, but this does not license anyone to institutionalize intolerance or trample over civil rights in the name of rebuking political correctness. Academia at large must empower instructors to engage their students in honest, adult discussions that may lead to unsettling truths. If students do not have the threshold for such learning, they are permitting their sensitivities to compromise their education. There cannot be taboos on academic thought. If political correctness tampers with a student’s intellectual evolution with iron regulations, students must reimagine it. College is not a haven from controversy and discomfort. College should invite controversy and its associated perspectives and encourage students to grapple with them freely.